1. Welcome. Over the past few days there have been a lot of new consultants join our team. If you are a new Shelf Reliance Consultant, I want to welcome you. If you are wondering who I am. My name is Heather and I am somewhere in your upline. I have been a consultant with Shelf Reliance since March of 2010. I have had a great time and great business success. I am excited to work with you and help you grow your business. Each Monday I send out a training e-mail. If you would like to check out past trainings your can access them on our team training blog: Shelf Reliance Leaders. I hope that these e-mails are helpful to you. 2. Our team is holding a Beginning Consultant Training Conference Call. If you are new please make plans to listen in. During the training we will be using a program that allows you to see my computer screen, so if at all possible please be near a computer. I’ll send you the phone number and log in soon. So watch for it. 3. Congratulations! May Rank advancements are out and I wanted to recognize the members of our team that advanced. I am so excited, I just had to share! In a month where I didn't have one party... I ranked to Director! Powdered Butter is one of the THRIVE products that I get the most questions about. Both consultants and customers and interested in it but sometimes have problems. I think that powdered butter is a good product. 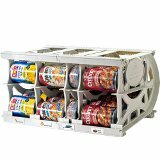 It is one that I personally store in my food storage and I think that it can be a great product for customers. Powdered butter is a little bit tricky. I have included all I have learned about powdered butter over the past year. I hope that you will try it at. If you come up with a great recipe using powdered butter I would love to hear about it. 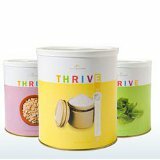 THRIVE powdered Butter: $25.39 (party price) for a #10 can contains 48 servings a serving is equal to 0.25 cups. So one serving equals: $25.39 / 48 servings = $0.5289 per serving which is 0.25 cup. But a pound of butter is 2 cups of butter so to compare them straight across we need to know how 2 cups of powdered butter costs. $0.5289 x 4 =. $2.1156 per pound. · Shelf Life: 5 years sealed in the can, once it is open you have 9 months to use it. Once open it does NOT need to be refrigerated. · To make spreadable butter for your toast: For 1 stick of butter (½ cup) : Mix ½ cup powdered butter with 2 Tablespoons water. Stir well. · Try adding a pinch of salt or sugar to enhance the flavor. · When baking: It takes longer for butter powder to “cream” (think about when you are making cookies and you cream the butter and sugar together) Don’t give up it will cream, just keep mixing. · When baking: I find that it is easier to get my cookies (or other baked goods) to have the correct texture if I add 1 Tablespoon vegetable oil to the dough. It is not necessary but I prefer it that way. · If the recipe calls for butter to be “cut in” as it does in many biscuit recipes. Just stir the butter powder into the dry ingredients with a whisk then add the water to rehydrate with the wet ingredients. How do I serve Powdered Butter at a party? Honey Butter (or raspberry butter, or coconut honey butter, or cinnamon cream cheese butter) on Cornbread: I usually serve the cornbread recipe from the starter kit recipes. In a small bowl, Whisk 2 T powder milk into 1 cup of water. Add vinegar, mix, and let sit for 5 minutes. Meanwhile in a large mixing bowl, whisk the butter powder and egg powder into ¼ cup plus 2 teaspoons of water. Add milk mixture into the egg/butter mixture. Mix together.Add the rest of the ingredients in and stir until few lumps remain. Bake in the preheated oven for 20 to 30 minutes or until a toothpick inserted in the center comes out clean. Using wire whisk or Kitchen Aid beat ingredients until smooth and creamy. Using wire whisk or KitchenAid beat ingredients until creamy. Note: This week on http://cookingwithmyfoodstorage.blogspot.com I am making lots of tasty treats from butter powder, including, chocolate chip cookies and pie dough. There are 5 things that new consultant need to know how to do on the back end. If you are a new consultant click on the links below and you will see a step by step instructions with screen shots that will walk you through each step. Add a customer—Add yourself as a customer, that way you can get commission off your own orders. If you are a new consultant please take a look at my online training. It will walk you through each of the things that I have found help new consultants the most. As always if you have any question please contact me.